With external fixation, pins are inserted through the skin into the bone and held in place by an external frame. The usual indications are open fractures such as a tibia fracture which requires dressings or attention to a wound or flap. It can also be used with closed fractures e.g. unstable radius fracture. External fixation is most successful in superficial bones e.g. tibial shaft. Avoid it in deeper bones e.g. the femur or humerus - here the chance of pin tract sepsis is greater. External Fixators are frequently used in the management of tibial fractures. For "Damage Control Orthopaedics" (where the patient's initial condition is too critical for prolonged surgery) to provide stability, and to maintain length. The exfix is replaced by definitive fixation (pate or IM pin) once the patient stabilises. 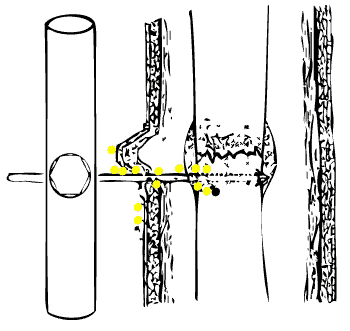 A temporary exfix can be placed over the joint for pilon or plateau fractures that are length unstable. It is later removed when ORIF is performed, once soft tissue swelling subsides (in about 10 days). The method provides rigid fixation of the bones in cases in which other forms of immobilization, for one reason or another, are inappropriate. This is most common in severe, open types II and III fractures in which cast or traction methods would not permit access for management of the soft tissue wounds and in which exposure and dissection to implant an internal fixation appliance would devitalize and contaminate larger areas and might significantly increase the risk of infection or loss of the limb itself. 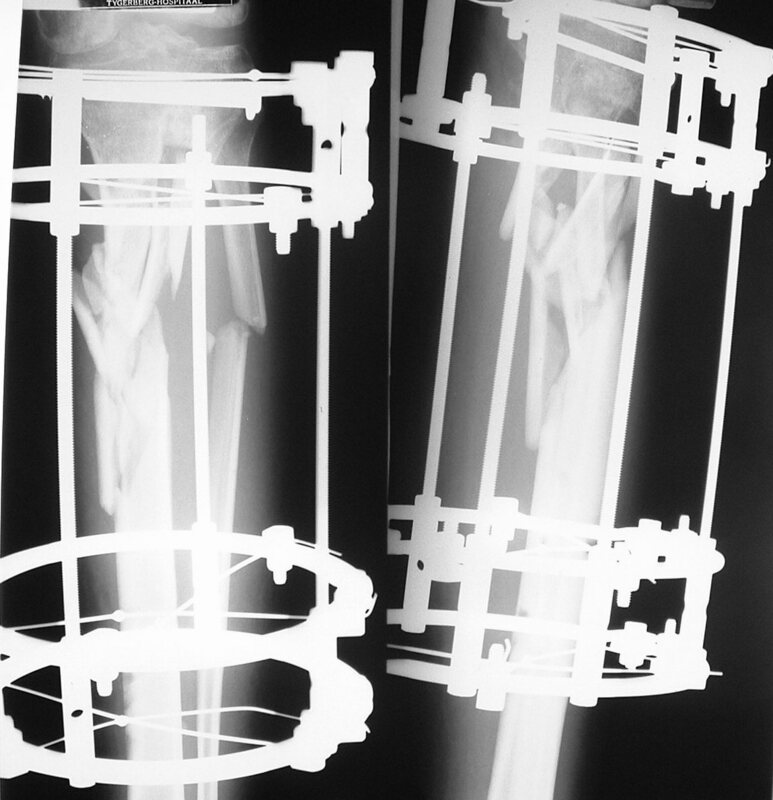 Compression, neutralization, or fixed distraction of the fracture fragments is possible with external fixation, as dictated by the fracture configuration. Uncomminuted transverse fractures can be optimally compressed, length can be maintained in comminuted fractures by pins in the major proximal and distal fragments (neutralization mode), or fixed distraction can be obtained in fractures with bone loss in one of paired bones, such as the radius or ulna, or in leg-lengthening procedures. The method allows direct surveillance of the limb and wound status, including wound healing, neurovascular status, viability of skin flaps, and tense muscle compartments. Associated treatment, for example, dressing changes, skin grafting, bone grafting, and irrigation, is possible without disturbing the fracture alignment or fixation. Rigid external fixation allows aggressive and simultaneous treatment of bone and soft tissues. Immediate motion of the proximal and distal joints is allowed. This aids in reduction of edema and nutrition of articular surfaces and retards capsular fibrosis, joint stiffening, muscle atrophy, and osteoporosis. The extremity is elevated without pressure on the posterior soft tissues. The pins and frames can be suspended by ropes from overhead frames on the bed, aiding edema resolution and relieving pressure on the posterior soft tissue part. fear of loss of fracture position. In stable, uncomminuted fractures early ambulation is usually possible; this may not be the case if these fractures are treated by traction or casting. Use of external fixation also allows mobilization of some patients with pelvic fractures. Insertion can be performed with the patient under local anesthesia, if necessary. If a patient’s general medical condition is such that use of a spinal or general anesthetic is contraindicated, the fixator can be inserted using local anesthesia, although this is not optimal. 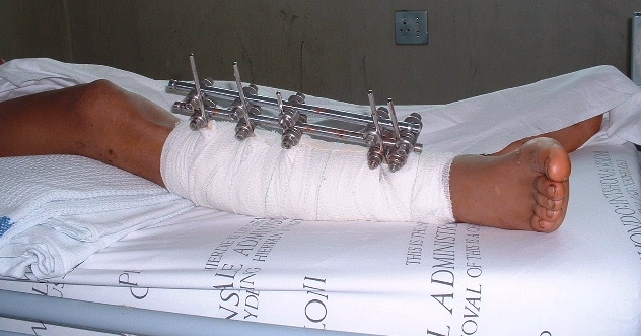 Rigid fixation can be used in infected, acute fractures or non union's. Rigid fixation of the bone fragments in infected fractures or in infected established non union's is a critical factor in controlling and obliterating the infection. This is rarely possible with casting or traction methods, and implantation of internal fixation devices is often ill advised. Modern external fixators in such instances can provide rigidity not afforded by other methods. Rigid fixation of failed, infected arthroplasties in which joint reconstruction is not possible and in which arthrodesis is desired can be achieved. Meticulous pin insertion technique and skin and pin tract care are required to prevent pin tract infection. The pin and fixator frame can be mechanically difficult to assemble by the uninitiated surgeon. The frame can be cumbersome, and the patient may reject it for aesthetic reasons. Fracture through pin tracts may occur. It is difficult to do delicate surgery such as skin flaps once the exfix apparatus is in place. Rather do this type of surgery before the frame is applied. bone can again become accustomed to stress. The noncompliant patient may disturb the appliance adjustments. The head injured patient may injure himself by thrashing his pin studded limb against other parts. Joint stiffness may occur if the fracture requires that the fixator immobilize the adjacent joint. e.g. an exfix placed over the ankle for a pilon fracture as there was insufficient space for pins in the distal tibial fragment. There are many potential complications with sepsis being the most common. Pin tract infection. Without proper technique for pin insertion and meticulous pin tract care, this may be the most common complication, occurring in 30% of patients. It varies from minor inflammation remedied by local wound care, to superficial infection requiring antibiotics, local wound care, and occasional pin removal, to osteomyelitis requiring sequestrectomy. A "ring sequestrum" is the radiological appearance of a sclerotic ring about the hole left from a transfixion pin (from an exfix or other skeletal traction device. Neurovascular impalement. Know the anatomy of the underlying limb, and avoid major neurovascular structures. The surgeon must be familiar with the cross-sectional anatomy of the limb and with the relatively safe zones and danger zones for pin insertion The radial nerve in the distal half of the arm and proximal half of the forearm, the dorsal sensory radial nerve just above the wrist, and the anterior tibial artery and deep peroneal nerve at the junction of the third and fourth quarters of the leg are the structures most often involved. Vessel penetration, thrombosis, late erosion, arteriovenous fistulas, and the formation of aneurysms have also been observed. Muscle or tendon impalement. Pins inserted through tendons or muscle bellies restrain the muscle from its normal excursion and can lead to tendon rupture, or muscle fibrosis. Ankle stiffness is frequent if multiple transfixing pins are used in fractures of the tibia. Delayed union. 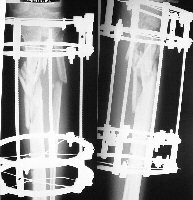 The rigid pins and frames can ‘‘unload’’ the fracture site, with cancellization and weakening of the cortex similar to that noted with internal rigid compression plate fixation if the fixator remains in place for several weeks or months. The callus produced is entirely endosteal, and delayed unions in 20% to 30% (and as many as 80%) of fractures have been reported in the literature with prolonged use of the rigid fixator. Compartment syndrome May occur in the limb treated with an external fixator. Unlike open surgery which opens facial planes, an external fixator is basically a closed method and there is a higher rate of compartmental syndrome. Refracture. Union due to the rigid fixation is largely endosteal, with very little peripheral callus formation. The de stressing of the cortical bone by the rigid fixation results in cancellization of the cortex; refracture is possible after fixator removal unless the limb is adequately protected by crutches, supplemental casts, or supports. Limitation of future alternatives. Such methods as open reduction become difficult or impossible if pin tracts become infected. If an external fixator is left in more than a week, there is a higher rate of infection if open reduction and internal fixation (ORIF) is later attempted. Do not use an exfix for an extended period ,if you anticipate open reduction will later be required. It is safe to do ORIF, however if the exfix removed within a week of application. In "Damage Control" surgery i.e. where anaesthetic time must be limited due to other life threatening conditions, in the multiply injured, a temporary exfix is a solution. Later when the patients condition stabilises, the exfix can be replaced by performing definitive open reduction and internal fixation. Place pins away from fracture lines. Organisms may gain access and infect the bone about the fracture area. Skin "tenting" i.e. folds caused by skin compression against the pin must not be tolerated - these folds lead to pin tract sepsis. Make a relaxing incision on the side of the fold, and suture any resulting wound. The more soft tissue there is, the greater is the chance for sepsis. Site the pin where the bone is as superficial as possible. Place the pin so as not to tension the skin. Close wounds, if possible before inserting the pin, as closure will be likely to move the skin. Make relaxing incisions to relieve skin tension - suture the resulting defect if necessary. Drilling wide diameter pins directly into bone will generate heat, this may lead to sequestrum formation and sepsis. Either pre drill the pins with a helical drill, or use hand instruments to insert the pin. Remove the exfix once its job is done. Replace the device with POP cast once skin defect ( the reason the exfix was put on for) has healed, and fracture has stabilised enough not to easily displace.